Anyone had any experience with Hernandez? I don't think I have used him on FM for years. 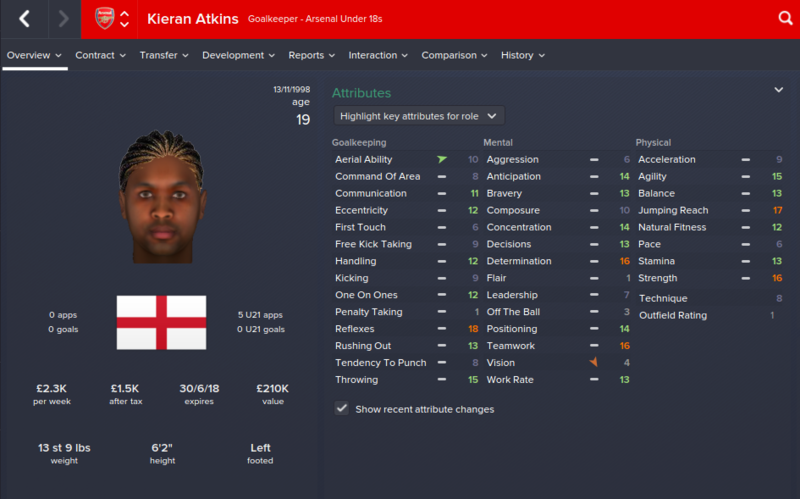 He is currently transfer listed for £4.2m, he seems perfect but only 2 star rated by scouts. Only downside is his aerial ability, but I drill crosses so shouldn't be a problem. I use a poacher, and he has all the right attributes! How did you get the player faces that big? Are you using the standard FM skin? Happy with how our 1st competitive hit out went. City's only chance was taken as we fell asleep and Toure poked home a corner at the near post. Followed by some great news after what I thought to be a disappointing performance from Arteta who just couldn't hold his own in midfield, Kroenke has decided we'll be bringing in Sami Khedira. I threw a couple skins, panels and stuff together to find something that I like. Liverpool must HATE playing us 3 times now I have put 7 past them. Also, I think I got the easiest Champions League group, ever? Thanks for your reply, do you know how I would get big faces in profile pictures with the standard skin? Wow that is rather easy. Lots of rotation going on? Must have made it easier to cope with the league campaign! You may want to visit the skinning forum. I had to ask myself, the lads in OTF helped me. Yeah, I played everyone who isn't my league starting 11 (except GK, as I still don't have a second GK :o) for every game. I wonder what would have happened if Tielemans/Pogba/Ozil/Ox were released on this group! The league is a breeze as well, just hit January... I have won every single game except a single loss to Chelsea. My GD is insane, this team is playing amazingly! No reserve keeper? Playing with fire! My scouts keep coming back to me saying avoid signing Doria, has anyone got him? is he good enough replacement for Kos? I know, I know... it is something I always do though I always wait until a good English regen pops up or one comes through our youth system, then they become the number two. How good is Debuchy for you guys? 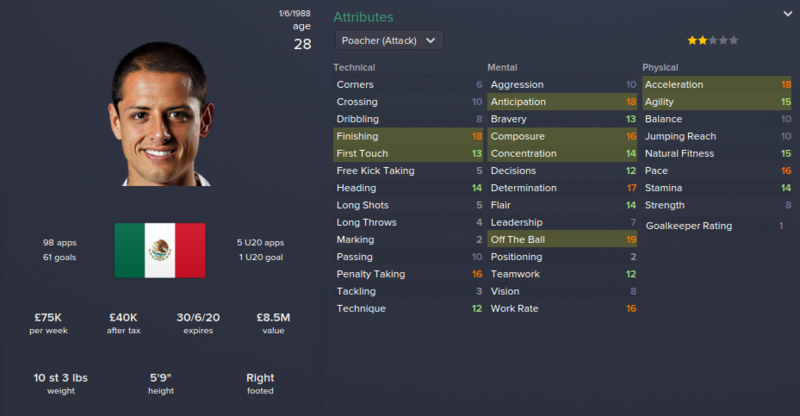 I'm looking to sign him at the start of the second season and can pick him up for 8mil. As solid a RB as you'll find, I reckon. As an attacking FB or WB, he's good. Not so good if you need your FB on that side to sit more. He tends to go awol into attacking areas when I really need him to be more careful. But that's my tactical setup; if an attacking FB is what you want, then he's good. Better ones are rare and expensive. Oh his aerial ability is making me cringe! As you can see, it is being trained! Still deciding whether to sign a new contract or to leave. Was approached by Dortmund at the start of the season, i declined and they snapped up Guardiola Athletico Madrid are 16th and just interviewed me, but its not very appealing. Just, and I mean just, scraped a 5-5 draw away against Maribor, I wouldn't mind if I'd fielded a weaked team, but it was the same team that beat City the previous week!! 6-4 against CSKA Moscow after been 6-2 up...I wonder if I'll have a CL game that doesn't go into double figures!? Anyone know how to get the best out of giroud? I play a 4231 Wide and he has not been doing very well. He only gets about 6.3 to 6.8 ratings and scores 1 goal every 3 to 4 games. I play him as a Complete Forward Attack. I play a short passing possesion based tactic. ;10035513']Anyone know how to get the best out of giroud? I play a 4231 Wide and he has not been doing very well. He only gets about 6.3 to 6.8 ratings and scores 1 goal every 3 to 4 games. I play him as a Complete Forward Attack. I play a short passing possesion based tactic. Well it depends what the rest of your system is. It all links in together. Specifically with Giroud, he is not quick, but has excellent strength, and teamwork. So he tends to suit playing a support duty, DLF, TM or CF support are all good shouts. Allowing him to link up with play. But this still depends on your system as a whole though. Brought Leo a striker as Depay got injured....worst thing of my save needed the board (now owned by the current Blackpool owner season 4) to intervene and gt the job done after Viera repeatedly said get him boss. Turned out he couldnt score if his life depended on it haha stay clear lads. Same, went to Dortmund for about £10mil. I have no individual instruction for the players except my GK which I give distribute to fullbacks. 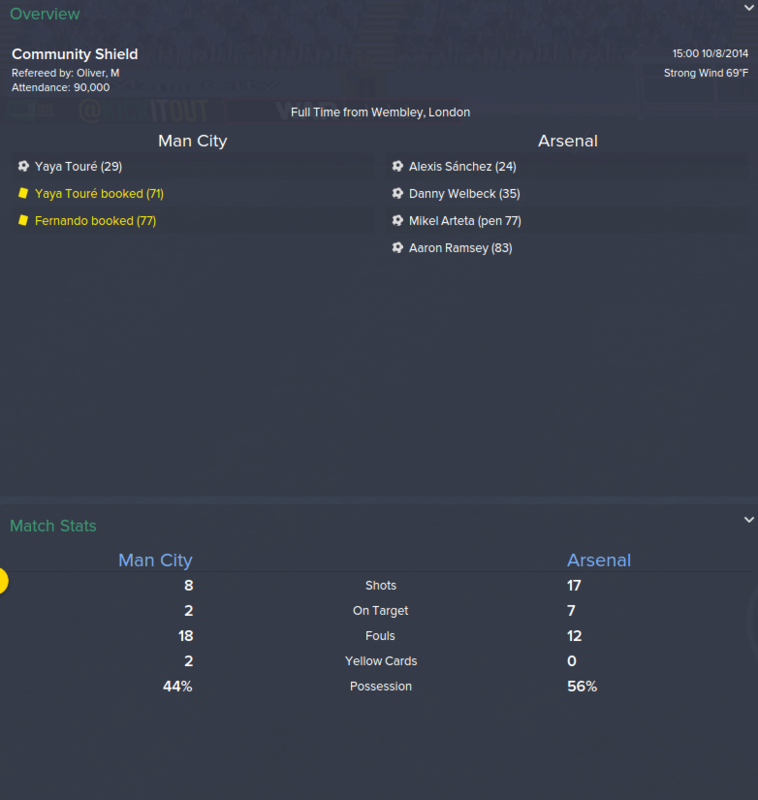 I play Giroud as my main striker and I am not sure if he is doing badly because of the role I chose for him. The duties seem balanced to me but I could be wrong. vozzon, what formation are you playing with? What transfers have you made? 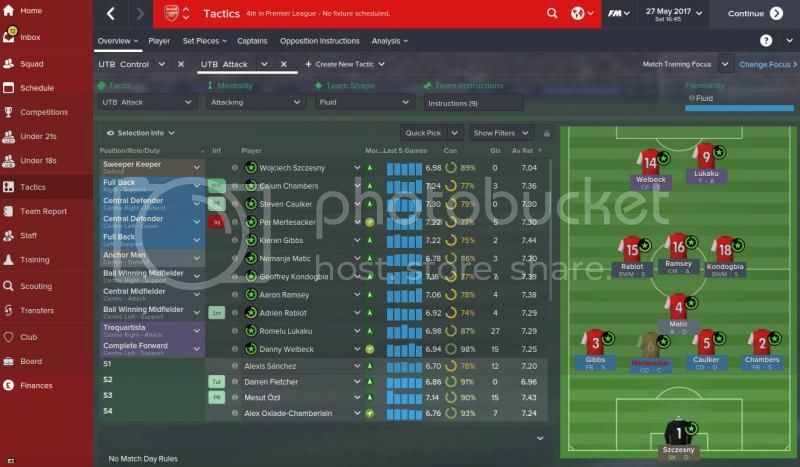 I struggled a lot in my first few attempts at an Arsenal save (I'm currently in december on my second season) and I've managed to get a consistant 4/2/3/1 formation that's producing the goods...I do mess about with formations in cup/easier league games. ;10035513']Anyone know how to get the best out of giroud? I use him as a deep-lying forward on support duty and he has been nothing short of excellent, the most impressive player in a season and a half. 22 goals in 2014-15 and 9 in 12 already for 2015-16, averaging 7.33. Second defeat of the season in only the fourth game. Completely outplayed but lost to a late Gibbs error. Heading a clearance inside the six yard box straight to Rooney. Good start to the Champions League and response to the Old Trafford defeat. Flattered us but still a good win. Second string and it showed. Very poor but Cazorla saved our blushes against 10 men. A good performance which we should have won by more. Tale of two penalties. Either team could’ve won it but a draw the fair result. Shane Long won player of the month. Mourinho manager of the month again and our own Chamberlain young player. League fixtures are kind and in the champions league we host Napoli. Walcott has just returned to light training so hoping to use him at the end of the month. Good recovery after the loss to Utd! So after not being able to play much FM over the last couple of weeks, I'm finally back onto my Arsenal game. I've just got to the end of the first transfer window, and I've pretty much given the squad a complete overhaul. Here's my transfer activity..
Yaya Sanogo also went on loan to Notts Forest for a 200k p/m deal and Gedion Zalalem went on loan to Charlton for a 85k p/m deal. The only player I didn't manage to get rid of that I want to was Mikel Arteta, who I was offering out for free but had no offers so he's sat in my reserves. Reports claimed that his wage demands deterred Chelsea, Valencia and someone else. As you can see, I spent a lot of money on relatively young talent. I planned to buy more British talent but everyone is overpriced at the moment. I also have a young player called Pavel Savitskiy coming in for free in January. Will aim to offload Diaby once he's fit. Tried to sign Rues but he didn't want to know, so ended up signing Ayew as a rotation for Ox. So my Squad looks a bit like this.. Happy with that. I did originally have a LB in my tactic rather than a LWB but once I signed Marcelo I shifted things around to try make sure he get's marauding forward as much as possible. So all in all a good start to the season. My tactic seems to be doing okay so I'll just tweak it here and there when I see fit. My champions league group consists of Celtic, Bilbao and Olympiakos. Also drawn Sunderland at home in the League Cup. Glory glory 2016/17, I have managed the clean sweep and done the quadruple, the gamble of paying 60 mil for Pogba and 20 mil for Gotze paid off perfectly. Yikes, got Mario Götze arriving on a Bosman for the beginning of 2017/18 season. I just couldn't resist, I play 3 central midfielders - LCM, BWN - Support, CM, CM - Attack & RCM, BWM - Support, so he'll fit in nicely for the CM. Also have Jack, Ramsey, Özil, Meyer & The Ox who can play there well. Anyone had any luck with Götze? Also, I highly recommend Adrien Rabiot, picked him on a free from PSG, loaned him out first season and he's as solid a player as I've ever had I think. Despite an inconsistent start, a team containing the likes of Emmanuel Petit, Marc Overmars and Nicolas Anelka managed to end the season strongly with an unbeaten streak of 18 games, with it all culminating in a memorable win against Everton on the final day in which Tony Adams scored the final goal before lifting the Premier League trophy. Days later, Arsenal made it a double, defeating Newcastle 2-0 at Wembley. The club didn't end the season with an eighteen match unbeaten streak because the win over Everton in which Tony Adams scored and secured the title wasn't on the last day of the season - it was the clubs last home game of the season. After that they went on to lose their final two games of the campaign; 4-0 away at Liverpool and 1-0 away at Aston Villa. The FA Cup Final was on the 16th May, some thirteen days after the win over Everton, and not "days later". I think it's great people put in the time and effort to make these threads, but if you're going to post stuff about the clubs history you should get the facts correct. I misread the article on that particular period of history, and in my own memory those Liverpool and Villa games are just blurs. That's my mistake and I've gone back and corrected it now with the actual facts. Thank you for pointing it out again. I didn't mean to come across as a knob, sorry if I did. I was thinking of using him as a St in a Trequartista role as Özil has been cracking there. Am selling Özil though as his contract is up 2018, he won't sign a new contract & I don't want to lose him for nothing. Well, third season finished. 4-1-3-2 got me to 4th in the league & The FA Cup. Not bad, chuffed with conceding the least amount in the league. Conceded 30 in 38, but still ultimately disappointing. Only got 4th spot on the last day of the season, somehow after losing to Man Utd?! has anyone tried the 4-3-3-0 formation, I am slowly starting to change formation so I can get Jack, Rambo, Pogba Gotze, Ozil and Sanchez all involved. This might mean retraining Ox in AMC or CM. Doing this with Gnabry and Nathen in mind as Ozil, Sanchez and Theo all ageing together.